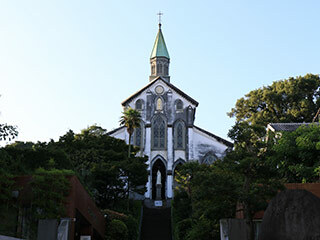 Oura Christian Church (大浦天主堂) is the oldest Christian Church in Japan. It is located in Nagasaki city, Nagasaki Prefecture where Christianity survived through the Edo Period. This church is constructed in 1865 by Louise-Theodre Furet. It is designated as the National Treasure and UNESCO World Heritage Site. This church was dedicated for 26 Japanese Saints who executed in 1597. There are 6 important statues and painting of Christianity. It has a beautiful Gothic architecture with beautiful arch ceiling. Even this ceiling is the western style, the construction method is all Japanese style. Admission: 600 yen for adult, 400 yen for High and Junior, 300 yen for under. It will be closed at Mass. No Photo inside the building. 1. use the Street Train No.1 to Tsukimachi. 2. change the train to No.5 to Oura Tenshudo Shita.